The Choir is made up of a team of twenty boys, a team of twenty girls, five Lay-Clerks, and seven Choral Scholars who are students at the University. The boys and girls join the Choir at the age of eight or nine and are boarders at the Chorister School in the Cathedral precincts. The Choir is directed by the Master of Choristers and Organist, with a Sub-organist, an Assistant Organist and an Organ Scholar. The girls’ team joined the Choir in 2009, and from September 2010 has taken turns with the boys in singing services. Their lives and responsibilities are identical to those of the boys. orchestras including the Northern Sinfonia and the BBC Philharmonic. In 2009 the choir sang at the Bobby Robson memorial service where the deputy head chorister Liam Jones sang a duet with Katherine Jenkins. The service was shown live on news channels across the world. In the same month the top eight chorister boys sang with Sting at a concert in the Cathedral which was filmed for a DVD released in November 2009. Durham Cathedral Consort of Singers was founded in October 1997: it consists of twenty-one adult volunteer singers and it normally sings about three services in the cathedral during each University Term. The daily worship of the Cathedral has been led by a choir for nine centuries, and the maintenance and development of the Cathedral Choir continues to be a high priority. 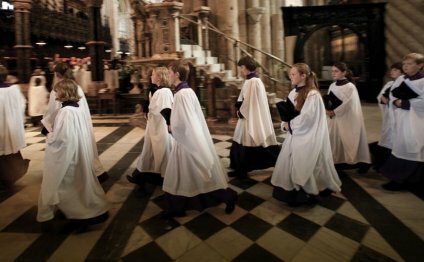 However, increasing pressure on choir members' time through the growing number of special services in the Cathedral led to the decision to start a second choir, Durham Cathedral Consort of Singers; this choir is able to extend the musical ministry of the Cathedral by singing services at times when the Cathedral Choir is not available. There are currently vacancies in all four voice-parts and all are welcome to apply for auditions. While previous experience of singing in a small choir is not a prerequisite, importance is attached to vocal ability and to first-class sight-reading. There is no remuneration; successful candidates will nevertheless be expected to commit themselves at the outset to attending all rehearsals and services.